← SlowCooker: Pulled Pork: Sauce Made of Sauces. 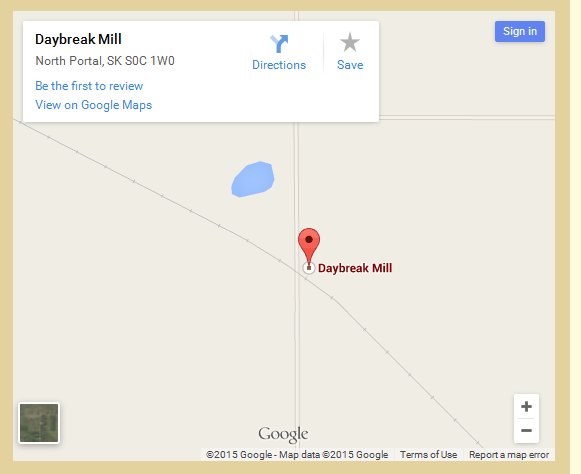 I’ve been search­ing online for places to buy Red Fife flour and my search lead me to the page of Day Break Mill. I imme­di­ate­ly hit the “con­tact us” but­ton so that I could deter­mine where they were. While I get the pic­ture: it’s in Saskatchewan, still.. did some­one think this was a good con­fig­u­ra­tion for the google wid­get? This entry was posted in fail, Life and tagged day break mill, red fife wheat. Bookmark the permalink.